The Delight indoor track lighting provides a flexible solution for adjusting the positions of light fittings with 350 degrees rotation and 90 degrees tilt to produce amazing accent and task lighting. This indoor 23W track lighting offers high power illumination with luminous efficacy of 90LM/W, suitable for high ceiling lighting environments. In addition, it creates sparkling and awesome lighting effects with excellent color quality that's guaranteed by outstanding optics design as well as high color index rendering of more than 90. Presented with systems of 4 wire, 3 circuits, 2 wires, single circuit as well as one-phase functionality, the delight indoor flexible track lighting can be used in various applications with maintenance-free and energy saving benefits. Moreover, this indoor black/white/silver track lighting can be used together with a large number of accessories such as snoot, honeycomb and different lens of 10°,24°,38°and 60°. 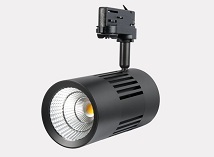 • Offered with light output of 90lm/W, accessible for delivering the perfect source of high lumens and low energy to high ceiling applications. 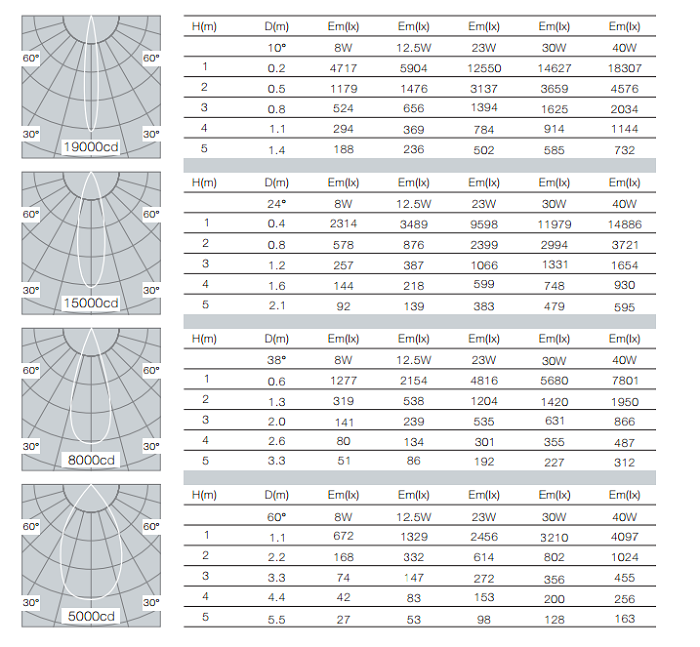 • Interchangeable lenses of 10°,24°,38°and 60°, allowing for providing diverse and colorful light distributions. • Offers excellent color index rendering up to 98, leading to visual merchandising in retail and grocery stores. 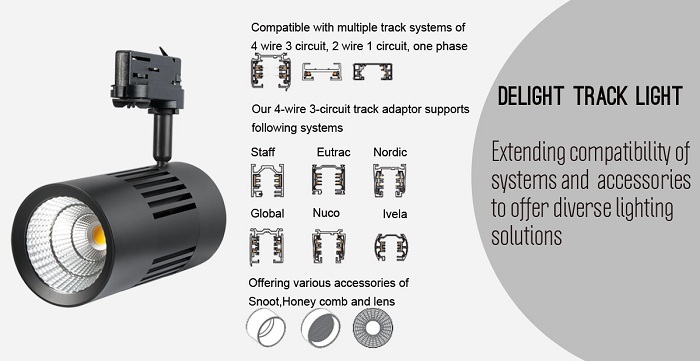 • The 4-wire 3-circuit track adaptor is compatible with the systems of Staff,Eutrac,Nordic,Global,Nuco and Ivela. • 10-100% Triac dimming solution, a great way to save energy use and lower electrical bills.